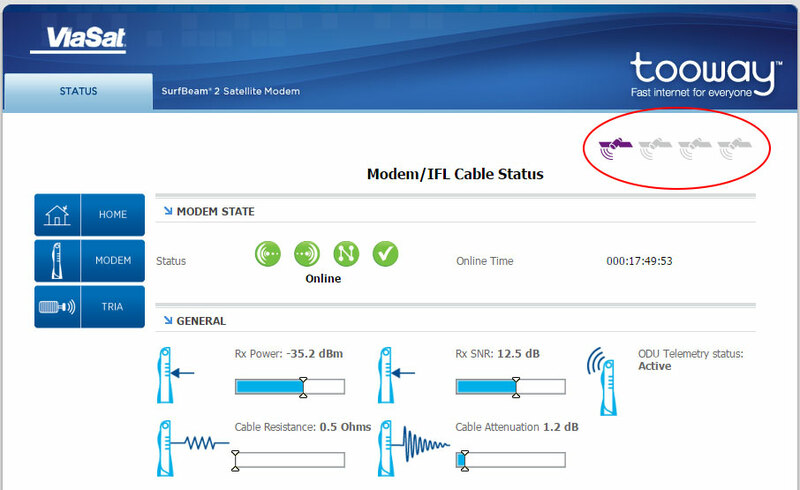 In the Viasat modem interface page, we can observe four satellites displayed at the top right. I'm on the spot 22 (n�3 purple in Tooway language), which corresponds to the first display sat on the drawing. I could see by looking at the scanning sequence modem the other 3 colors of satellites: 2 Green, 3 Blue and Orange in four. Do you know why the modem interface clearly displays the spots in a different order than what is usually displayed: Spot 3 - Spot 4 - Spot 1 - Spot 2 ? I don't know the answer, but the sequence with 1 and 2 together and 3 and 4 together is perhaps to minimise the electro-mechanical polarisation switching in the TRIA. There are 4 types of beam, so that you can make a pattern with no two beams of the same type next to each other. Two beams use the same polarisation (1+2) and two beams use the other polarisation(3+4). Within each pair of beams with the same polarisation they each use different frequencies. Maybe the person who configured the scanning simply chose to start with beam 3. Another possibility is that the scanning process will always start using the current polarisation switch position in the TRIA.� That would usefully reduce the number of switching actions. I wonder if other sites observe different scan sequences ? your hypothesis of reduction functioning of polarizer is interresting. I would be interested to know too s'i this sequence of scaning is different depending on the spot and its polarization. My guess would be that the Surfbeam modem starts by using any information it has stored about previously successful operation. If it was a manual I would scan a range of downlink frequencies (for all four beam types), record which carriers were the best, then switch polarisation and do the same frequency scan again. Then noting the best downlink carrier, reset the polarisation if necessary and tune to that best carrier. Then move on to the uplink acquisition process. Can anyone else help ? I switch off my modem every evening (reason: many electrical storms here) and switch it on in the morning.� I think it is not doing any scanning of alternate beams.� For a couple of weeks after it was first installed (a year ago), whenever it was switched on it would scan more than one beam.� Now (for many months) it just starts up on the green beam (GUI number 4) and seems not to scan any alternatives.� I wonder if this is because it now remembers which is the best beam for it. I think it all depends on whether the ViaSat modem is activated or not. If not activated, then the modem will search each 'spot' and determine which delivers the best signal. Once the modem has determined the best spot beam, the Activation Code has to be entered and the modem will then remember the spot beam that it has been activated on. It doesn't really matter which spot is used to point the dish but, obviously, makes sense to use the one calculated as being the best for your area. Once the modem is activated, it will remember that it is assigned to a particular beam ... that's why you have to re-activate a modem if you move out of one beam and into another.